All-inclusive resorts cater to travelers seeking a fuss-free vacation with convenience, lots of extras and excellent value for money. However, often, the buffets and cuisine in some of these resorts can be bland and uninspiring. 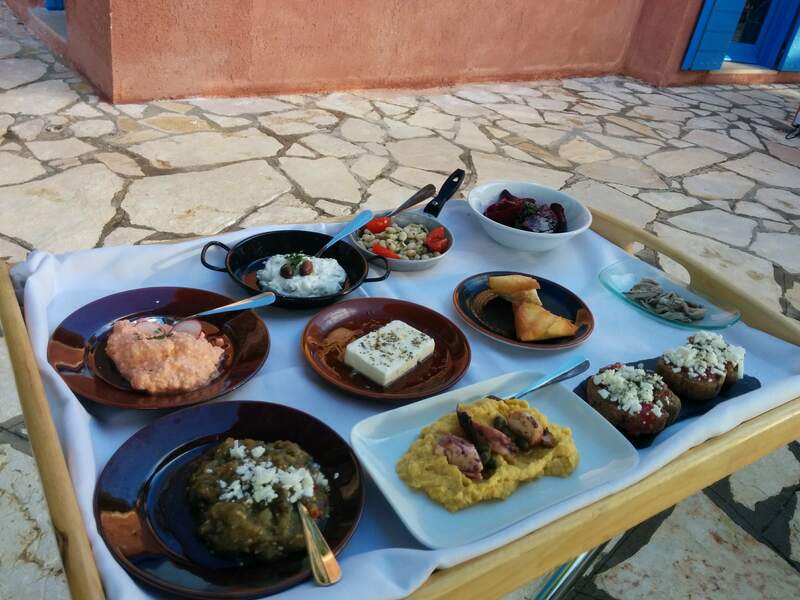 Over the past year, I had the change to enjoy the culinary offerings of several Grecotel hotels and resorts. Grecotel is known for their superlative breakfast, lunch and dinner options, traditional flavors and fresh local ingredients. 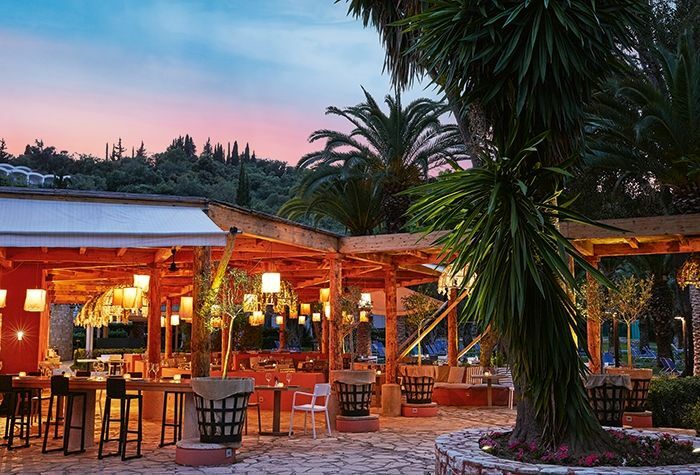 Their LUX Me Daphnila Bay Dassia resort in Corfu is far and above any usual all-inclusive. The resort elevated their gastronomy concepts to the next level with several unique fine dining restaurants. Haute Cuisine, tasting menus and gourmet options with wine pairings from the resorts exclusive wine collection are part of this LUX Me concept. 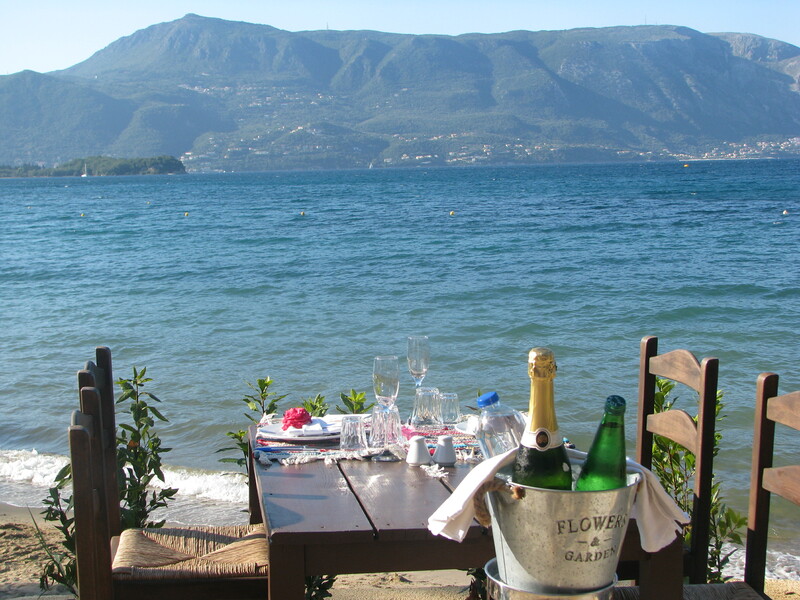 If you are a foodie, follow your taste buds and join me exploring fine dining in Corfu Daphnila Bay Dassia. LUX Me Daphnila Bay Dassia sits in a waterfront paradise, just 13 km away from Corfu town. 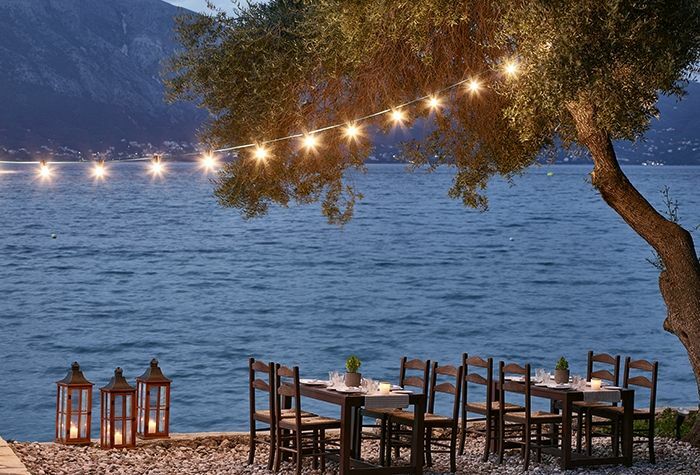 Located on the green Kommeno peninsula, it is joined by two other Grecotel hotels: the Grecotel Eva Palace luxury hotel and Grecotel Corfu Imperial, exclusive resort. The resorts are connected by romantic boat and luxury shuttle bus. The LUX Me Daphnila Bay Dassia concept offers seven restaurants of which five a la carte restaurant concepts. 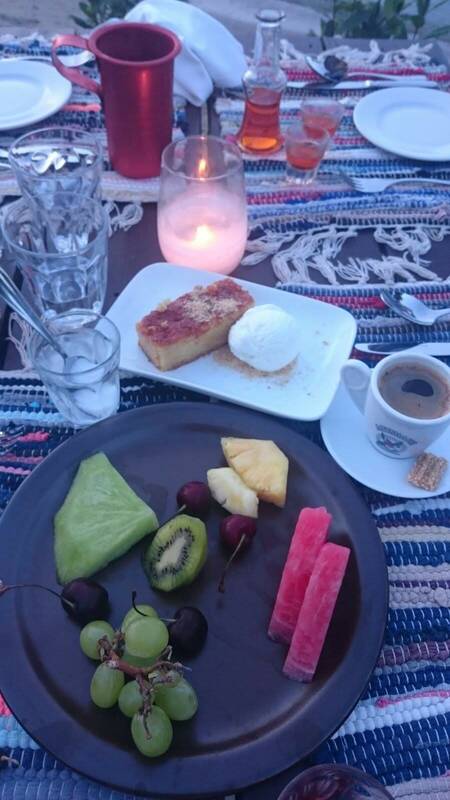 During our stay at Daphnila Bay Dassia, we indulged at the Antica Cucina main Buffet & Barbeque Restaurant (read the review here), Giardini di Olivo, Il Gattopardo, Kumquat, Aristos, and Tavernaki. An overview of all dining options at the resorts can be found here. 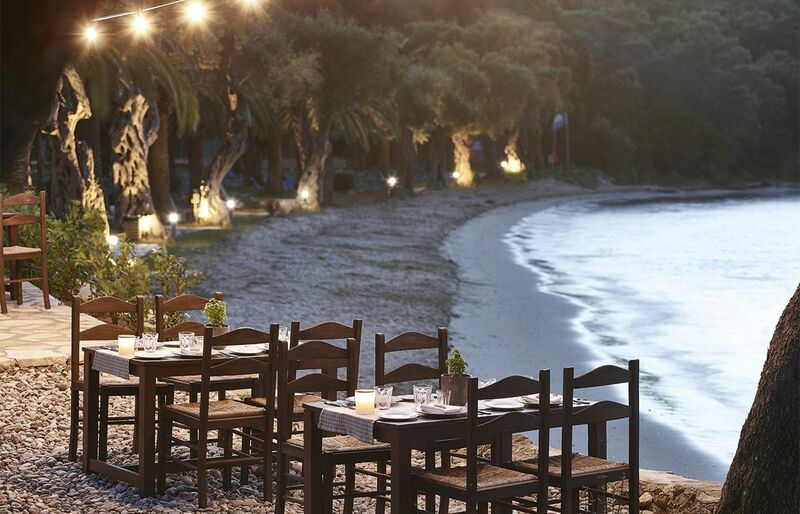 The Italian a la carte restaurant Giardini di Olivo (pictured above) is located on the beach overlooking the beautiful Dassia Bay. The location of this restaurant is truly stunning! In a warm romantic atmosphere created by pergolas, lights, and candles, it reminded us of an authentic Italian seaside trattoria. The menu features traditional home-cooked favorites of the Italian cuisine with lots of flavors, vegetables, and fresh pasta. 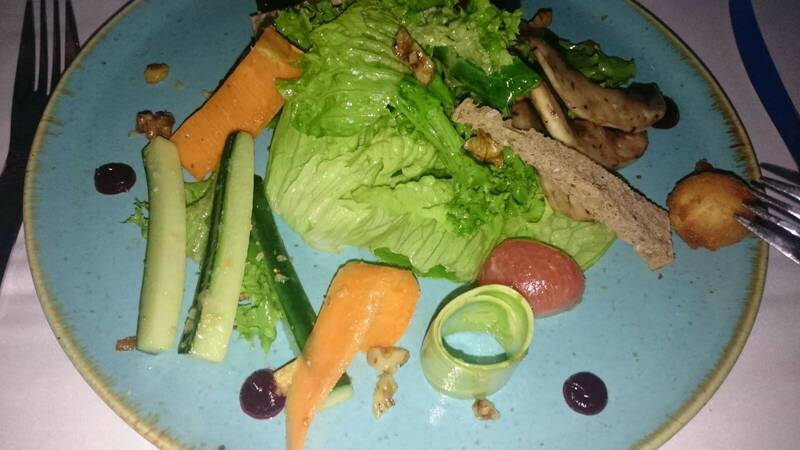 There are also more sophisticated dishes with meat and fish salmon and a choice in green starters and dessert. Before we ordered, we were offered some lovely appetizers with olive oil and cheese. We then indulged on the comforting dishes of pork with perfectly roasted potatoes and delicious sauce and crispy pan-seared salmon with fresh vegetables. 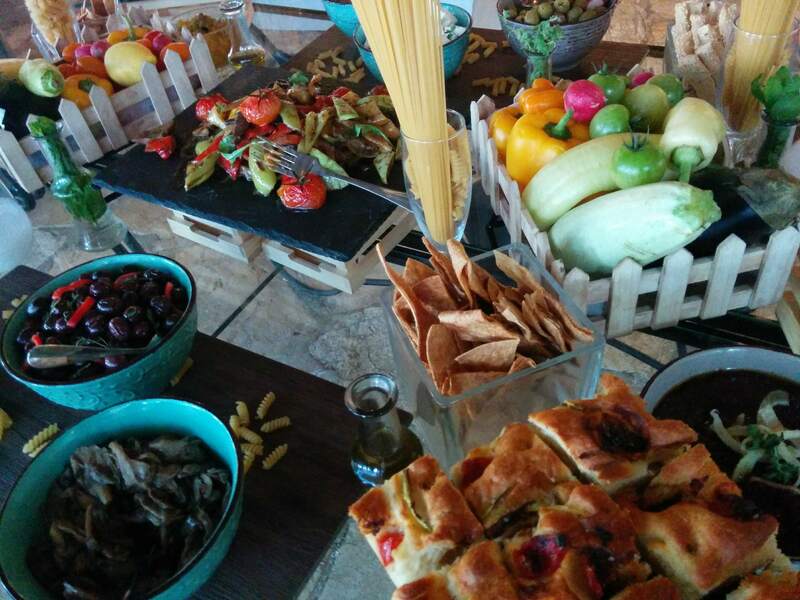 For the children, there was a kids menu featuring healthy options such as the Cream of vegetables from the chef’s garden with organic olive oil as well as pasta, fish fillet, homemade pizza from the stone oven and grilled chicken fillet. We celebrated my daughters birthday at Giardini di Olivo and ended the night with champagne and a custom-made chocolate cake prepared by the hotel patissier. 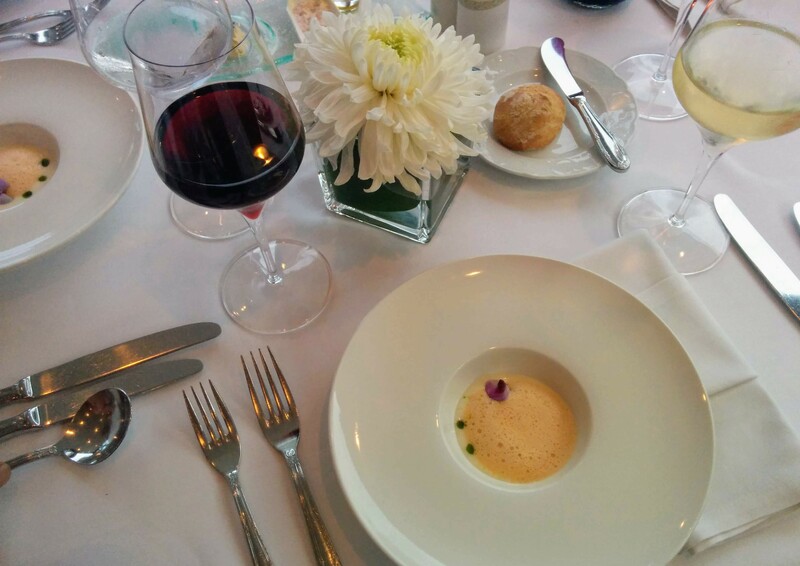 For an upgraded fine dining experience, Il Gattopardo cannot be missed. This stylish outdoor restaurant overlooking the pool offers a tasting menu or Menu Degustation based on either the French, Greek or Italian haute cuisine. It guarantees a long night admiring and indulging many different tastes and structures of beautifully presented artful dishes with matching wines. The restaurant finds itself on a large teras near the lobby overlooking the pool and Dassia Bay. 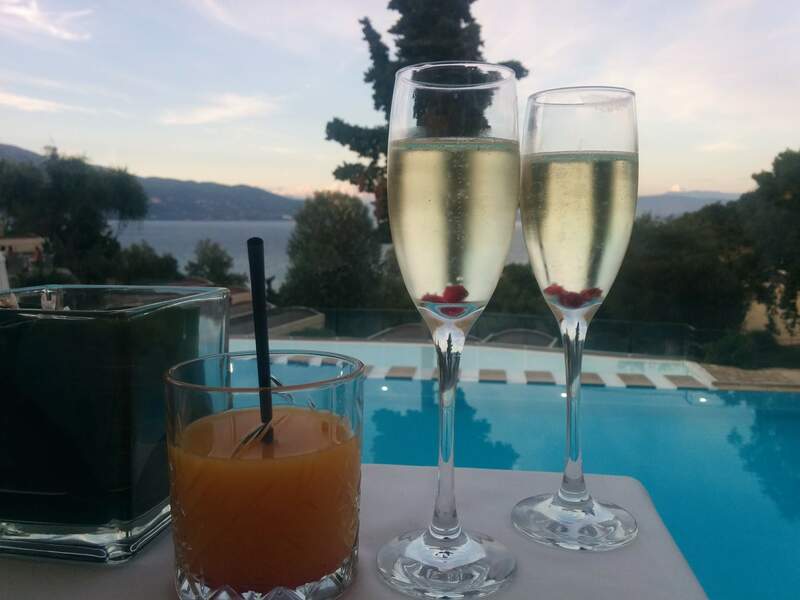 We started our beautiful evening with an aperitive, a virgin cocktail for the children and several starters. The sommelier of the hotel came to welcome us and introduced the exclusive wine collection of the hotel. Based on our menu choice and personal preferences he recommended several wines for our dinner. I was very excited to learn more about the wines from organic Greek local grape varieties such as the Dourios Malagousia and the Rose Grammenos Family. 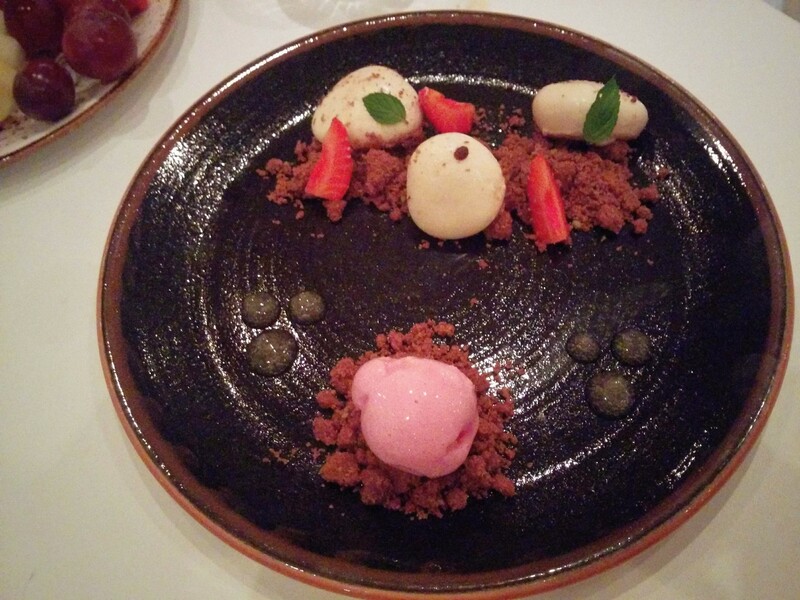 There are 3 Mediterranean tasting menus consisting of four courses including dessert. The first one is based on the Greek cuisine, the second is Italian and the last one is French inspired. Us adults choose the Greek and Italian menus and the children tried the French one. 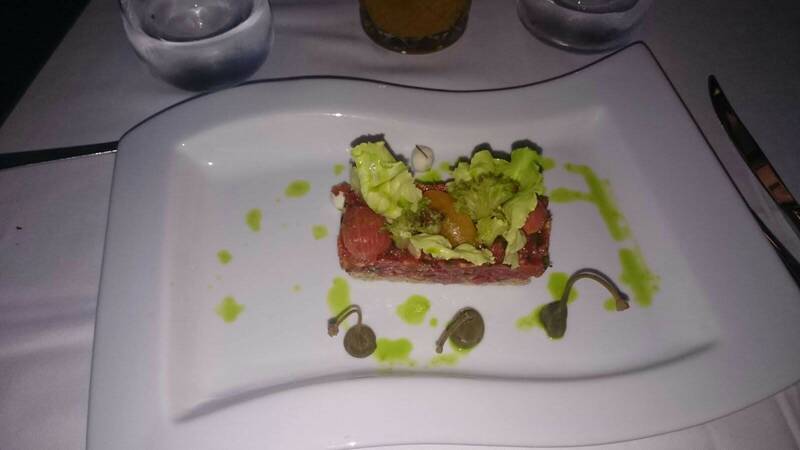 We started with a trilogy of tomatoes with lettuce hearts almonds and capers, a sea bass and salmon tartar and a salad of fresh vegetables with hot goat cheese and honey and fig dressing. 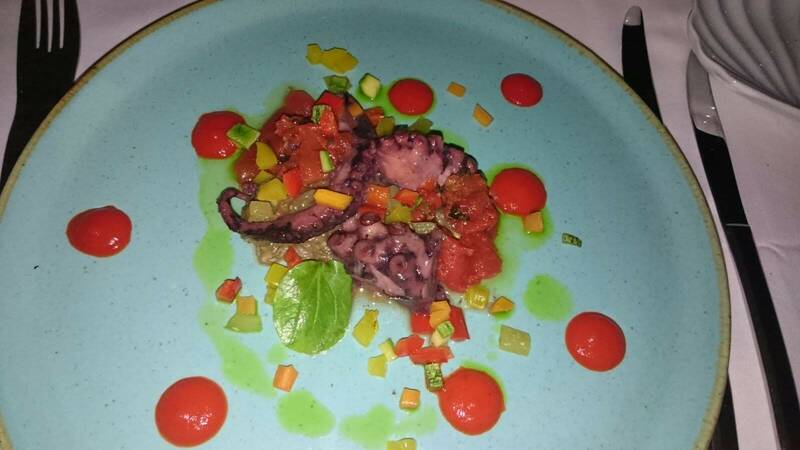 We had then the caramelized octopus with grilled aubergine and aniseed-flavored sauce, homemade tortelli with black truffle sauce and sea bass fillet with grilled shrimps, risotto with cuttlefish ink and shellfish sauce. 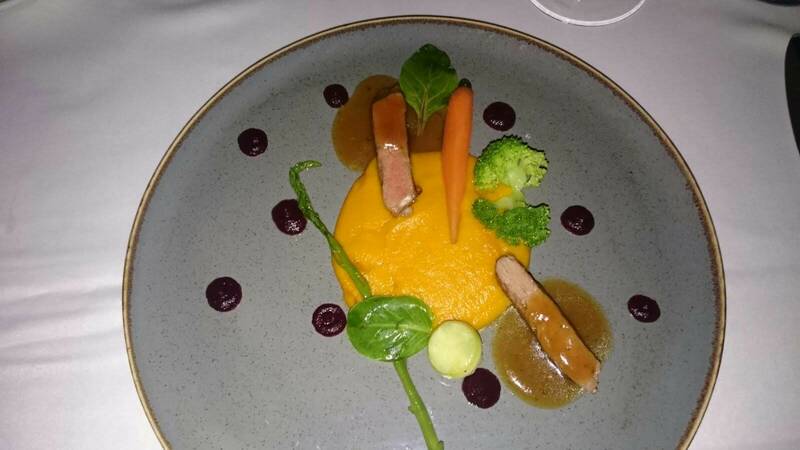 Our main courses were lamb, pork fillets with sage and prosciutto, and veal with white-grape truffle foie gras. The desserts were equally inspired by their countries of origin: Chocolate cream flavored with thyme honey accompanied by mastic ice cream from Greece, mascarpone cream with Madagascar vanilla with lime and passion fruit and almond biscuit from Italy and a French Mousse au Chocolat with crispy chocolate and hazelnut praline biscuit. All served by unpretentious, experienced and attentive staff, our water and wine glasses were never empty. 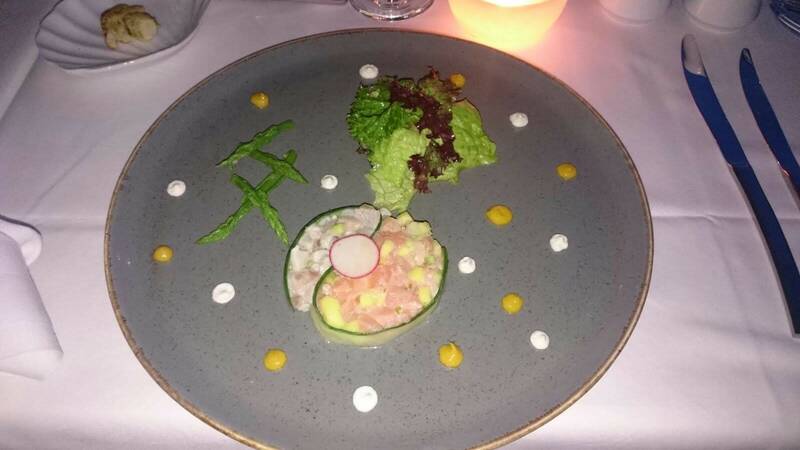 I much liked the starter of sea bass and salmon tartar accompanied by asparagus, avocado, mangoes, cream cheese, and lime. My favorite main course was the lamb with herb crust, roasted potatoes, and marzipan sauce. 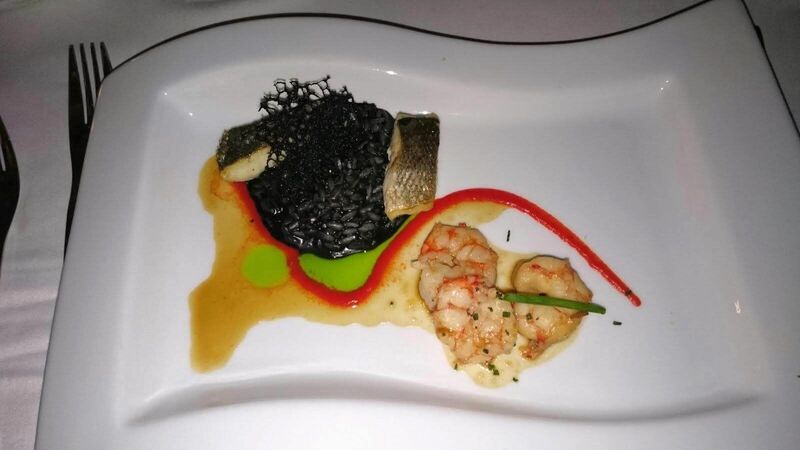 The children love the homemade tortelli with porcini and black truffle sauce and the nicely presented sea bass fillet with risotto with cuttlefish ink. Every offering was very good, well prepared and beautifully served. Together with the passionate explanations of the sommelier, this was an unforgettable culinary journey through the Mediterranean. 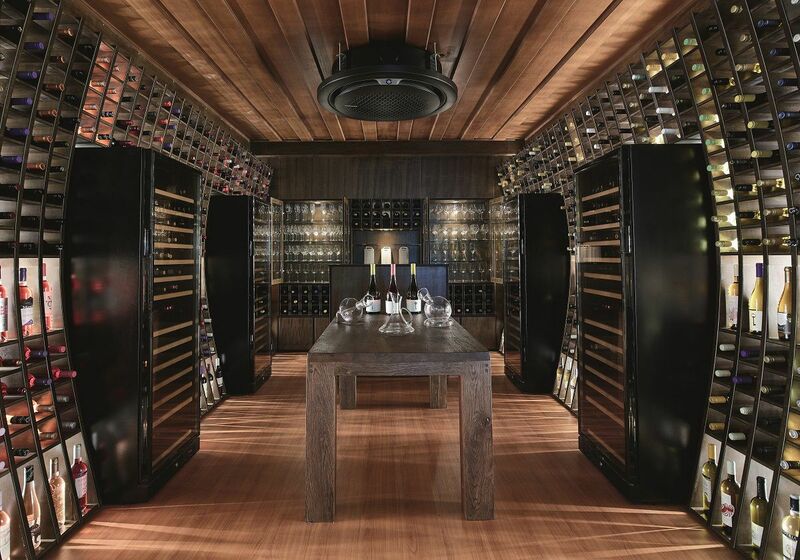 It is worth mentioning the sommelier hosts wine tastings in the wine tasting room of the resort. There is a wide selection on wines with more than 150 unique labels of local and international wines, indelibly linked to the a la carte menus. 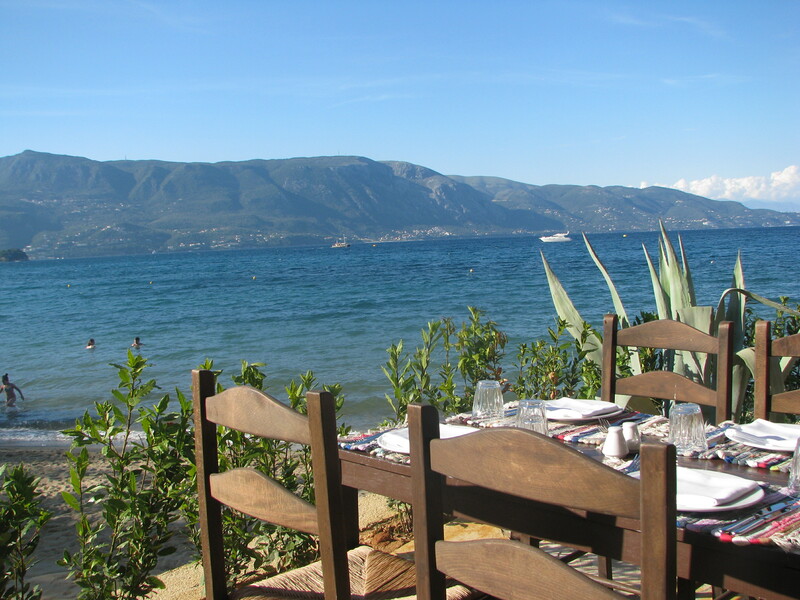 Tavernaki is a newly opened Greek a la carte beach restaurant open for lunch and dinner. I believe that Tavernaki is not just a Greek tavern. 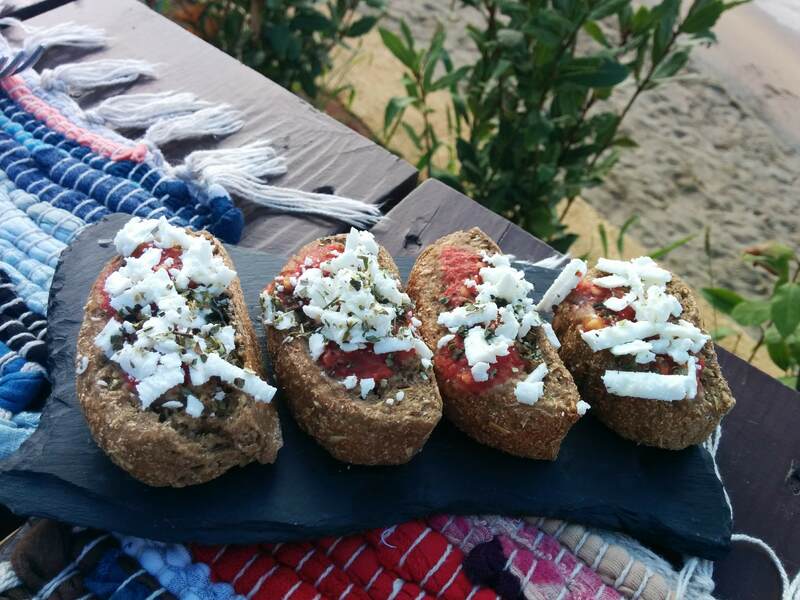 It is a true Greek experience showcasing everything that is great about Greece: very special people, honest unpretentious fresh food, beautiful sea views, great atmosphere and warm hospitality. 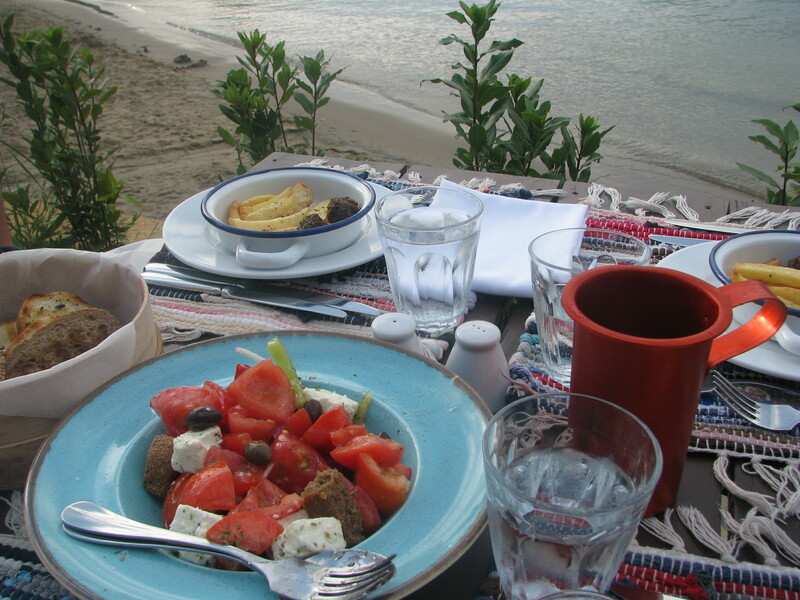 Greece is beautiful in its simplicity and that is what Tavernaki is all about. This is one of my favorite places in Daphnila Bay Dassia. The tavern tables and chairs are located directly on the beach and overlooking the bay. 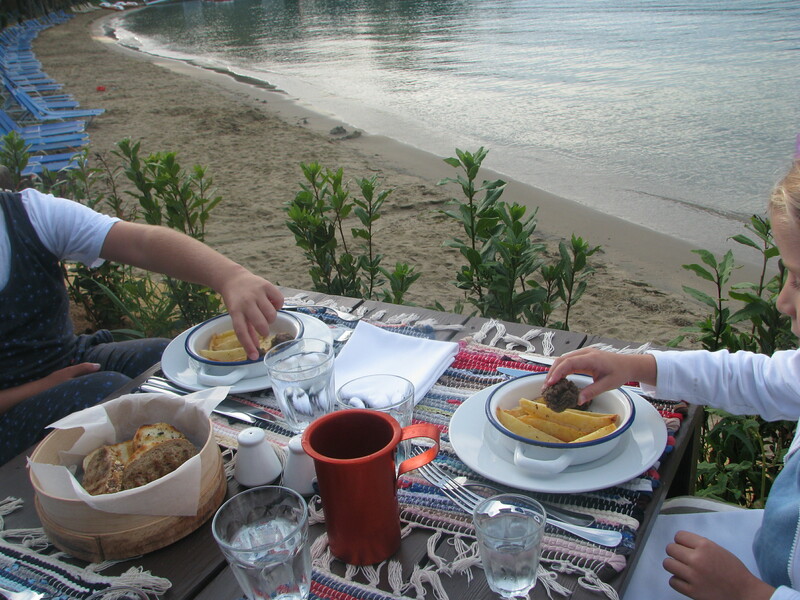 My kids loved running on the beach here until the food was served. The staff who welcomed us was warm and attentive and had our table ready. Unusual for a Greek tavern, Tavernaki has a wine list and it features a wide selection of excellent local wines. We tried the wines from the local Grammenos Family. The lunch menu had Greek traditional dishes and lots of seafood such as potato salad with smoked mackerel, shrimp croquette, traditional bougiourdi, feta cheese, shrimps with pasta in shrimp bisque, steamed mussels in white wine with ouzo and garlic, grilled octopus, cuttlefish stew, mackerel in the oven and fresh desserts such as yogurt mouse with lime. All served and prepared with organic olive oil from the Agrecofarms. My children loved the fried meatballs with freshly cut and fried potatoes. Best of all is the Greek Salad. 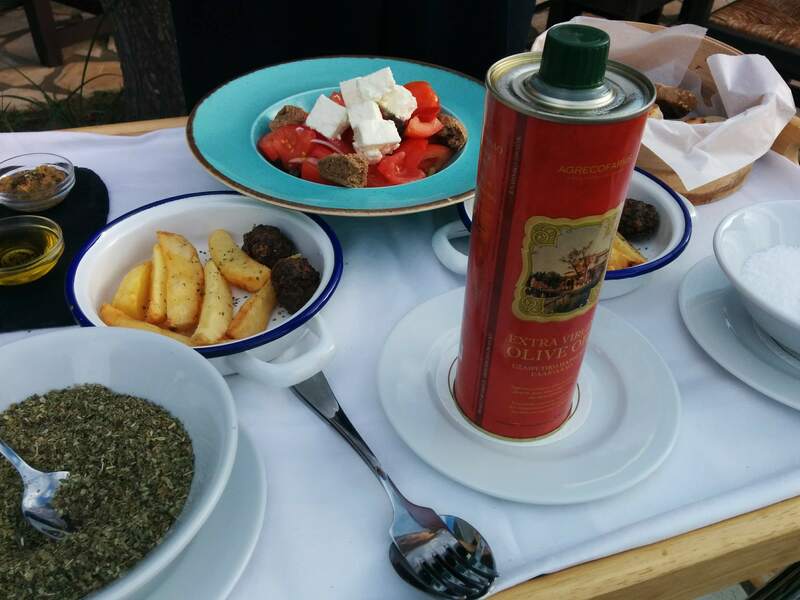 All elements of this famous Greek dish such as oregano and olive oil are presented on a large serving dish and mixed together at your table. An experience not to be missed. 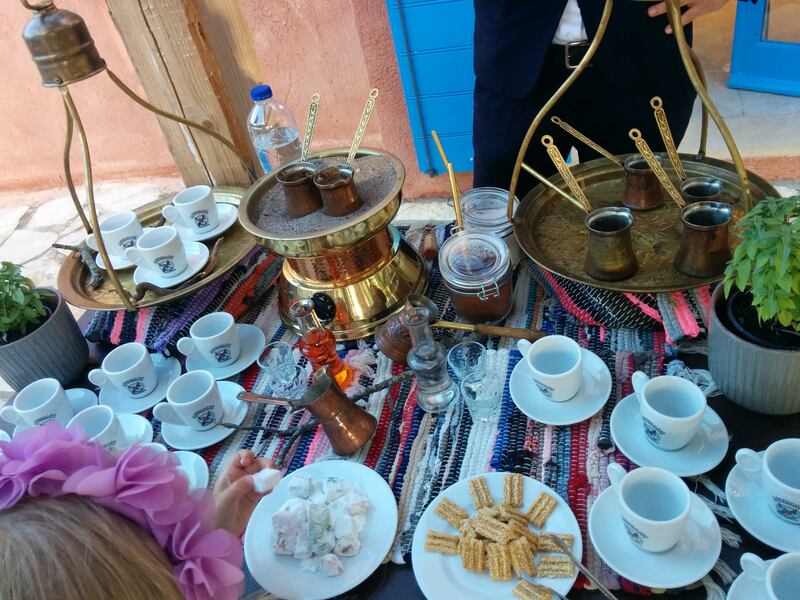 The same goes for the Greek coffee ritual, have a look at how the Greek coffee is prepared at the coffee corner! 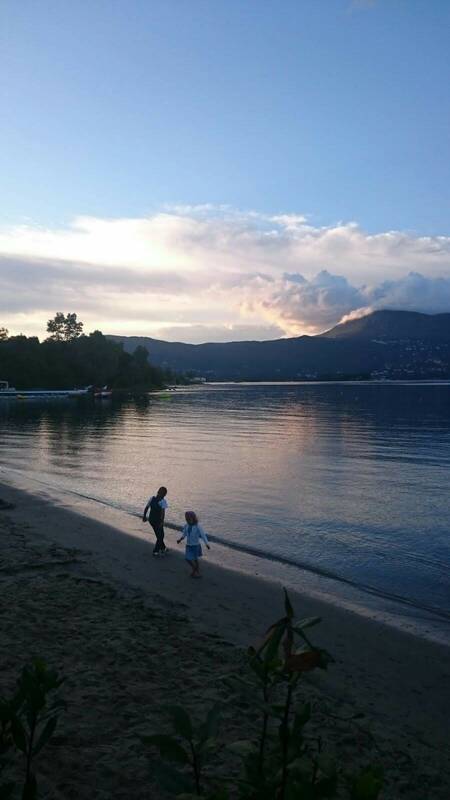 Dinner in Tavernaki is as romantic and family friendly as a dinner on the beach in Greece can be. 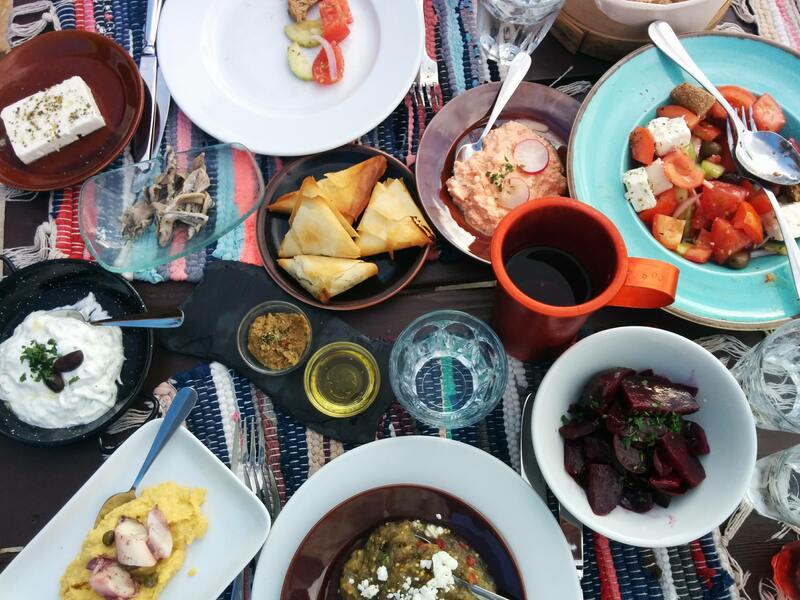 All together we indulged some of our favorite Greek mezze and dishes such as tzatziki, fava and moussaka, all served in traditional pots and pans in a very relaxed setting. We ended our Greek family feast with sweets, fruits, Greek sponge cake, Greek coffee and a traditional Corfiot liquor made of the bitter local kumquat fruit. 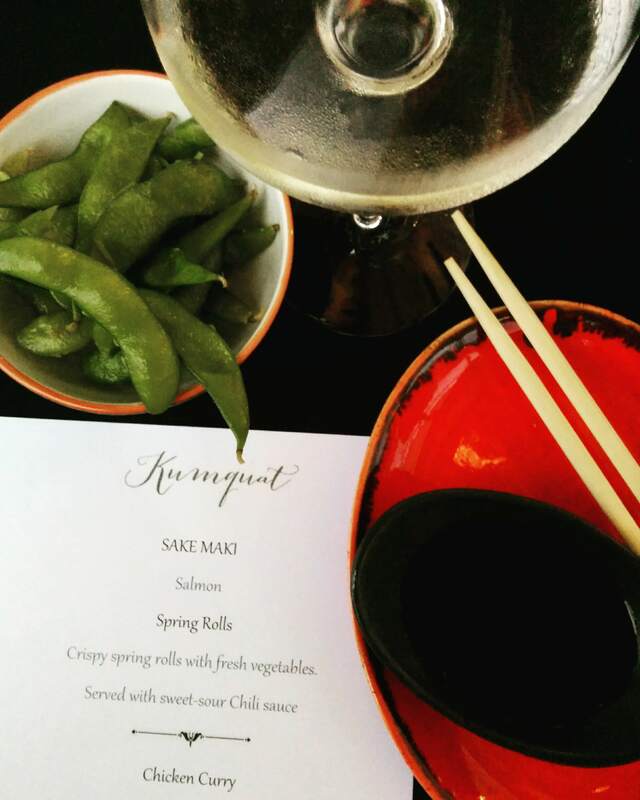 Kumquat is the Asian a la carte restaurant at Corfu Imperial. Being located at the tip of the peninsula, it was very romantic dining here surrounded by pergolas, the sea and beautiful hotel pools. 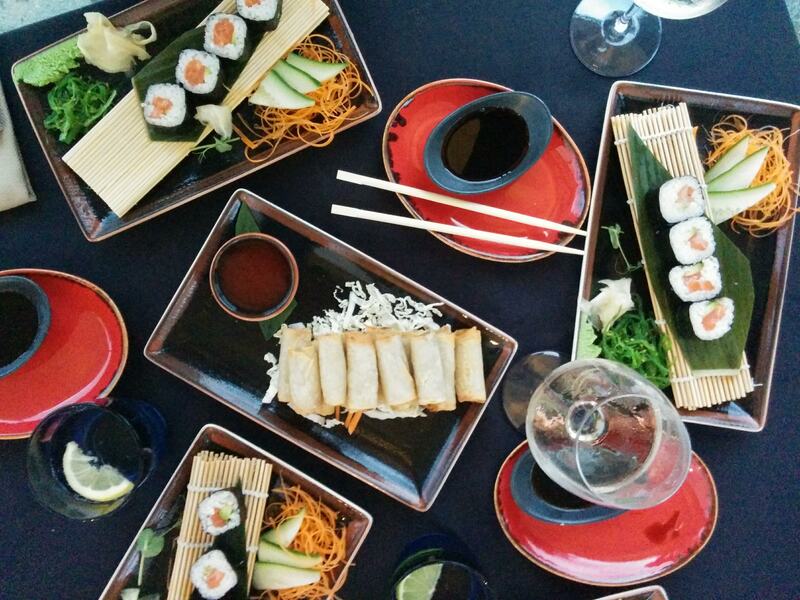 This Asian experience is included in the LUX Me programme of the Daphnila Bay Dassia, as part of the dine around experience of LUX ME concept. 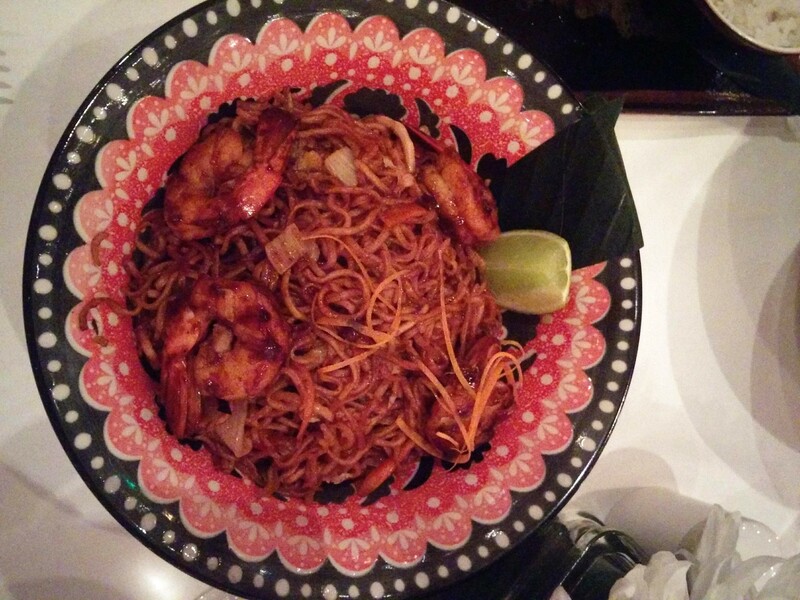 Kumquat offers several interesting fusion dishes of the Asian and Latin American cuisine. 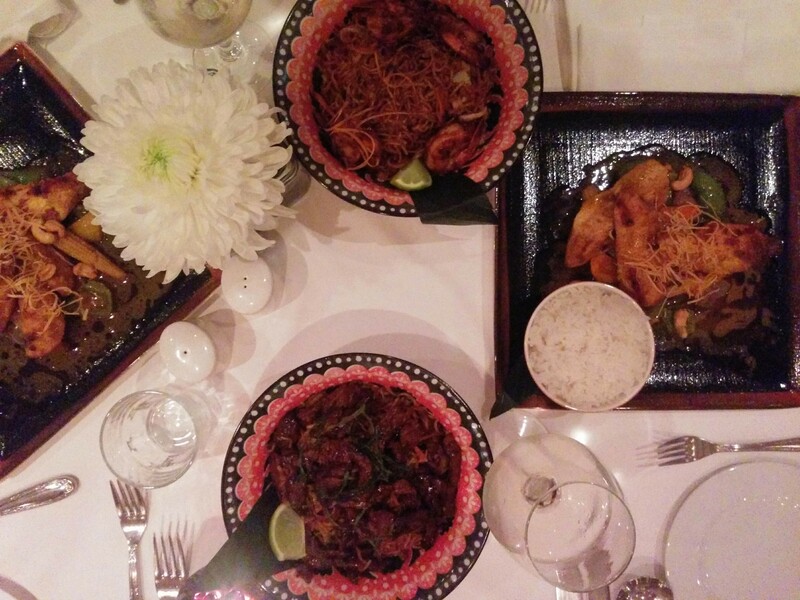 Our dinner started with sake maki, salmon, crispy spring rolls with fresh vegetables and sweet-sour chili sauce and continued with exciting chicken curry with vegetables coconut milk and cashews and oriental style noodles with pork and soya sauce. 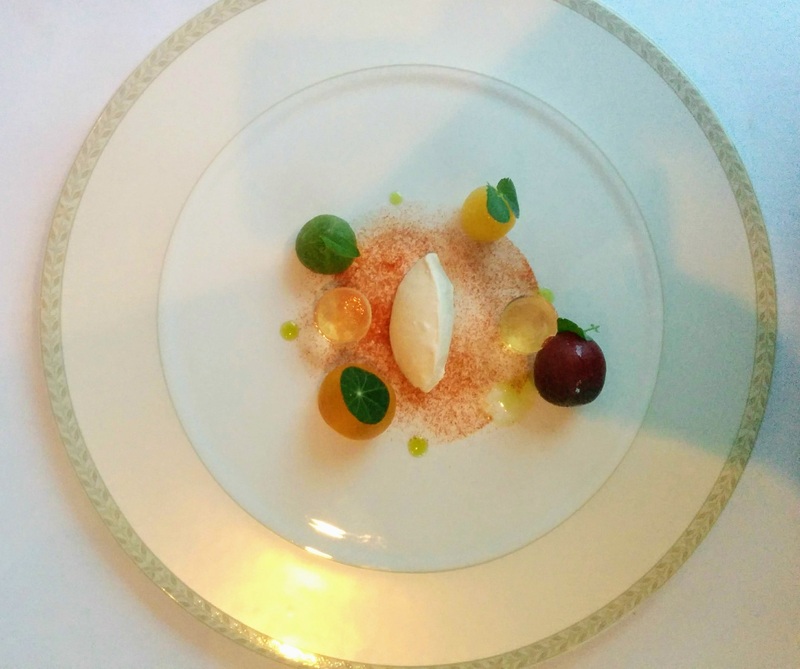 The cream of green matcha tea and the coulis yuzu with red fruit sorbet and fruits was irresistible and surprising. 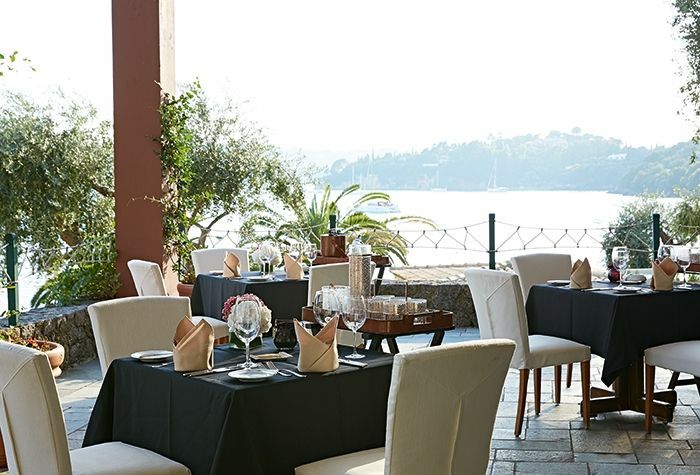 Aristos* is a French fine dining a la carte restaurant located at the Corfu Imperial. 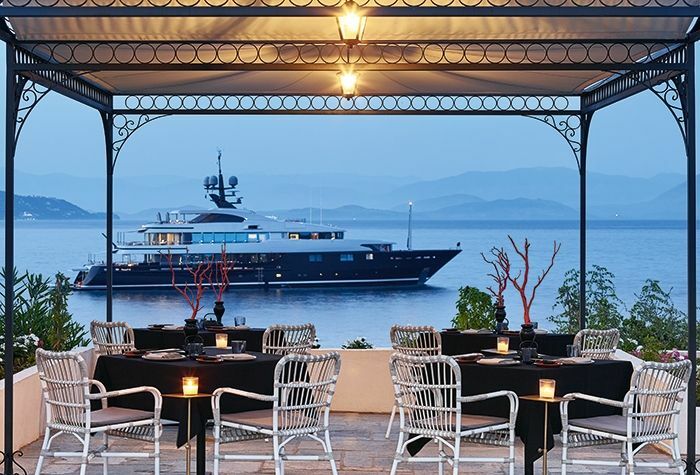 Named after Greek shipping tycoon Aristotle Onassis whose private island Scorpios is located nearby the resort, this stylishly decorated restaurant exceeded all our expectations. 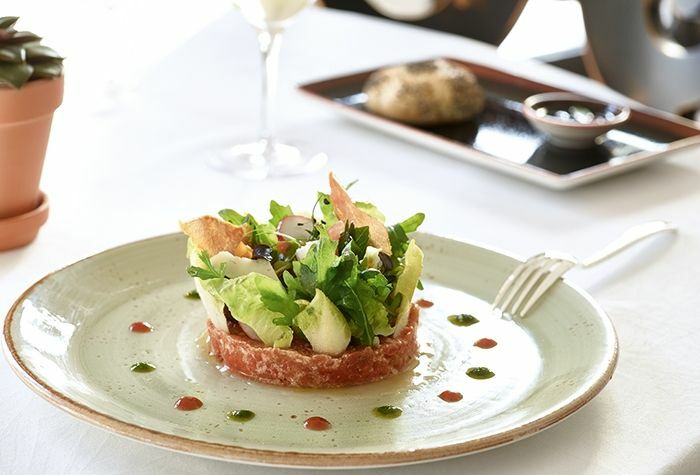 At Aristos, food is about engaging senses and merging tastes. The Aristos signature dishes form one of the most lavish menus in Greece presented in a mindblowing décor. 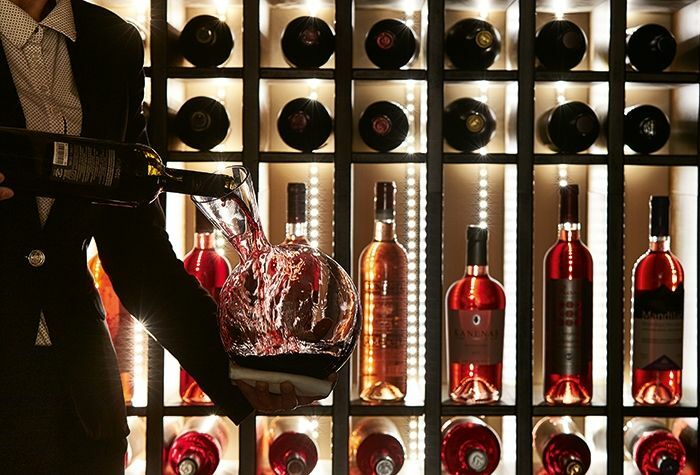 Our most unique dining experience started with a look at the incredible wine list with an exclusive collection of Greek and international wines. Dazzled by its offer, we had ourselves advised by the Maitre. A decision we did not regret. 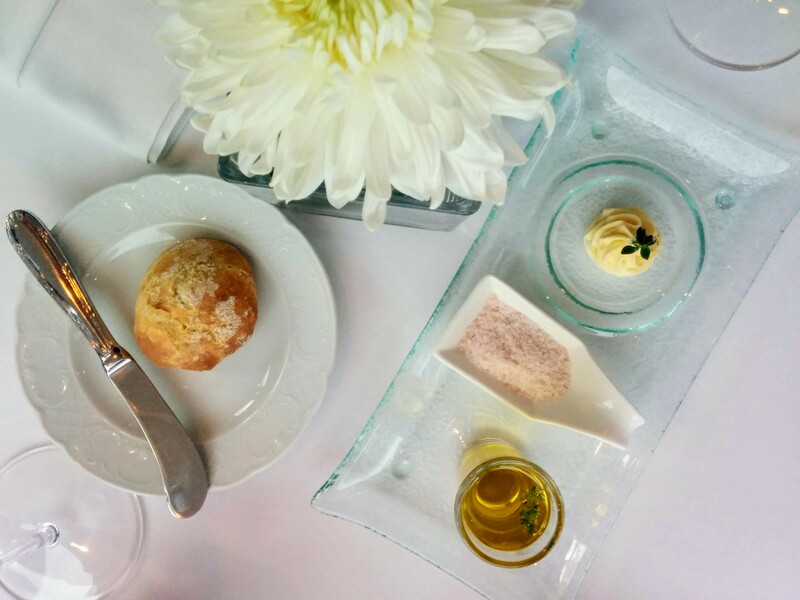 We started with some refined appetizers of organic olive oils, bread and butter and a foam bisque beautifully decorated with eatable flowers. 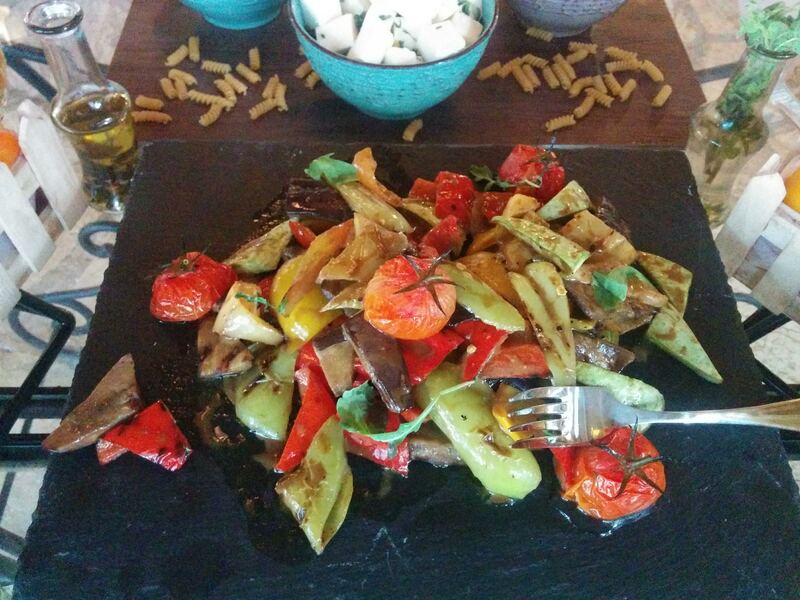 After that, we were introduced to molecular cooking with a starter of tomato, sage and young olive oil. 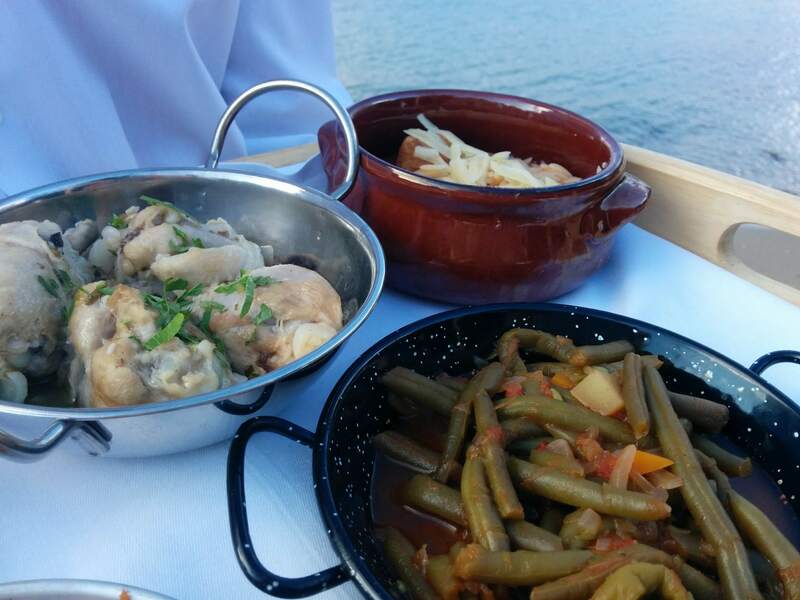 Our main courses were sea bream with basil, zucchini and lemon and beef with onions, vinegar, and french fries. An elegant profiterole ended our taste experience. We had an amazing dining experience. The service and ambiance were of top quality, the staff was outstanding service, the views and decor unforgettable. Thank you Aristos! Forget everything you have heared about about all-inclusive resorts. Wipe your memory clean of bland buffets and medium quality a la carte. Not so at the Greek Grecotel hotels and resorts. Grecotel does not stand for any of those outdated stereotypes but for high quality buffet and a la carte dining and haute causine. LUX Me Daphnila Bay Dassia is not an all-inclusive resort. It developed the unique LUX Me concept. With a large choice of a la carte restaurants, fine dining concepts and award winning gastronomy, this concept offers families and foodies to indulge in the stress-free luxury of a pre-paid vacation while gorging on some of the best food the world has to offer. 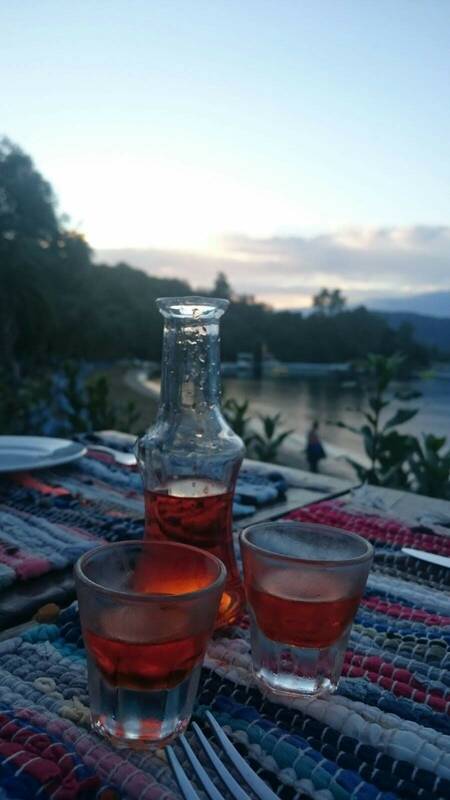 For family-friendly things to do in Corfu during your stay at LUX Me Daphnila Bay Dassia, check out my blog post about the Danilia Village in Corfu. 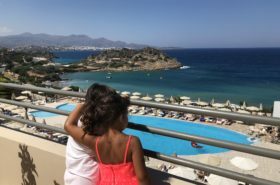 If your family likes to combine gastronomy with waterfun and waterparks, than also check out my review of the Grecotel Grecotel Olympia Riviera resort in the Peloponnese. The beach resort hosts the brand new Olympia Aqua Park, the largest in a resort in Greece. During this vacation at the Grecotel Olympia Riviera resort we also enjoyed a family spa & wellness experience at the Elixir Thallaso Spa. Disclaimer: I was a guest at LUX Me Daphnila Bay Dassia with my family. As always, the opinions and thoughts expressed are my own. *Aristos is not part of the all-inclusive program of LUX Me Daphnila Bay Dassia.